Posted byEditorial Staff	 November 11, 2016 January 12, 2019 Leave a comment on Google Pixel vs iPhone 7 Plus: Which Smartphone Has the Best Camera? The camera seems to be one of the most attractive features each time you witness the launch of a smart-phone. You’ll hardly come across anything nicer that will provide you with the best quality pictures. 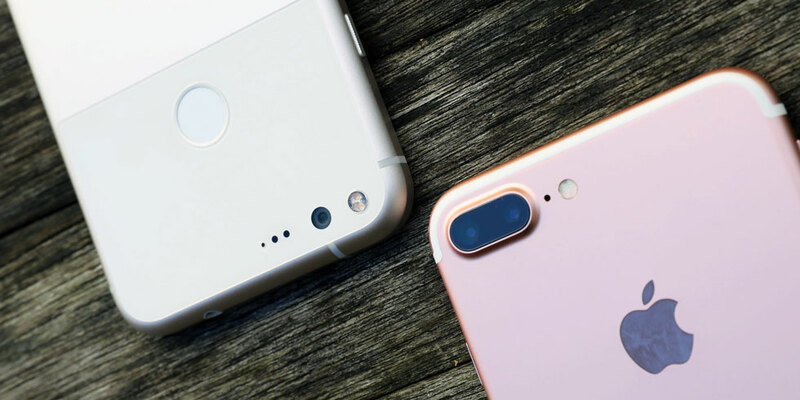 The best cameras have been developed for the iPhone Plus 7 and Google Pixel phones yet it’s still very tough to choose between these two models. This article will throw some light upon facts that may help in distinguishing one from the other. There are a few preambles that aren’t quite necessary to begin with. The faux-Bokeh effect is worth mentioning in your smart-phone camera. It enables you to take pictures and develop manual blurring effects in the background. It takes your snap-taking ability to an entirely professional level. You must have noticed how important it’s for the fashion photographs to appear stylish with the help of Bokeh. This new camera feature has much for Apple to bet on since a majority of its competitors have developed advanced cameras without really researching on the user needs. Once the Cupertino giant has done considerable research on their mobile device, they have succeeded in launching the iPhone 7 plus with something that they’re boasting as the best camera on a smart-phone. Utilizing the unique software from Apple, the camera has enhanced its zooming ability up to 10X and improved its image quality. Image quality with higher zooming levels enables you to take more improved snaps from a distance without obtaining any blurry layer. The image signal processor of the iPhone 7 plus has been upgraded with telephoto lens worth 12-megapixel (56mm) and wide-angle lens (28mm). Apart from the True Tone quad-LED flash, the camera of this model comes with an f/1.8 wide lens aperture, advanced selfie camera of 7-megapixel and optical image stabilization. Google Pixel camera has been highly rated for the image quality of the lens and the standard of its camera. This one is certainly the best camera phone to be tested in a smart-phone and the outcome seems to be quite significant. This camera yields great performance even under low-light conditions. It’s perhaps the best smart-phone that can capture almost anything clearly with its 12.3 mega-pixel snapper yielding huge coverage of 1.55 micron pixels and even features an f/2.0 aperture. Even while standing at a distance, this camera will enable you to capture every minute detail with great clarity. Images tend to be crisp even when you aren’t using flash to capture a campfire at night. Smart Burst and a few other incredible features are offered with this camera app. This feature enables the camera to take a series of shots and picks the best shots automatically. Out of all Google smart-phones that have been launched till date, this one seems to have the quickest capture time. You won’t really experience any shutter lag with most of your action shots. The images captured by this camera are processed for further improvement like setting dynamic range, aligning pixels and eliminating blur. Unlike the earlier Google smart-phones, this one ensures fast picture processing due to the presence of a Snapdragon 821 processor and RAM worth 4GB. Both smartphones have their own advantages. Google Pixel is capable of capturing vibrant photographs whereas iPhone 7 Plus follows the true life color. Below is one small video that explains everything about both the smartphones.